8 Nov - Today's update from Expedition Leader Dani for Second Team : Today we walk from Pangboche to Dingboche, all climbing members are feeling good. We made it down to Chukung Village. Everyone's ok. They even lowered the ‪dog‬ down the pass! A DOG has followed us up here. We are not sure what to do. Should we try lowering the dog down the cliffs on the other side of the pass? Brite starlite nite on Amphu Labtsa pass. Remotest valley in Himalaya layed out below us. If this was Alps, it would be named Eagles Nest. Climbing Action in Amphu Labtsa. Photo Scott. Very tough descent to basecamp. High winds, blowing snow, hard to stand up or walk, one tent damaged. All Sherpas & members ok, thank God. 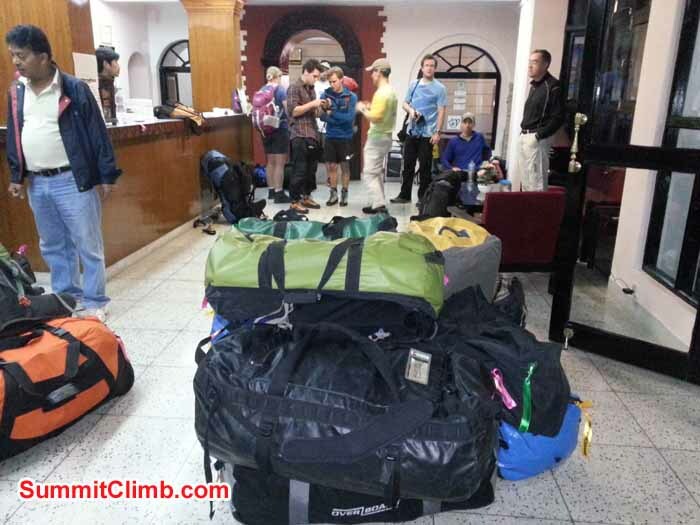 All members and all Sherpas have returned safely from Mount Baruntse. It was a perfect sunny day. Now we are at Highcamp replenishing. Splendid day for ascent to camp 1. Sunny, no wind, no cloud. Steep snow climbing up the west col. Everyone made it! We're at 6100m/21,000ft. On our way to the summit. Our first stop will be camp 1, where we will sleep tonight. Tomorrow we go to camp 2, then try summit. Need luck! Today's update from Expedition Leader Dan Mazur: Dear BaruntseNews followers. Sunny morning here in basecamp. Stunning views of Ama Dablam & Everest. Resting for tomorrow's summit push. Enjoy walk through flat grass valley. Merging rivers, many birds below Mount Hongku. Unspoiled campsite on White Lake. View Everest Lhotse. We are back down in basecamp. Hot showers, delicious food, warm sun. All is well. We are on the ‪SUMMIT‬! of Mera Peak. Its sunny, windy and beautiful. ‪EVEREST‬ looks incredible from here!! In high camp. Awesome Everest views, but very windy. 9 hours until departure @ 2am with 9 members (men & women) and 4 super star Sherpas. Climbing to Mera Peak high camp @ 5800m/19,000. Sunny, light wind, light cirrus, mainly blue sky. Please wish us luck for tonight's ascent. At Naulekh Lake. Brilliant sunshine, breathtaking mountain views around including Mera Peak. Looking forward to glacier training tomorrow. Today's update from Expedition Leader Dan Mazur: Now we are making an acclimatization walk to 5300m/17,000ft on a high ridge above Kare. Surprised we can see Ama Dablam from here. Go Mera! Today's update from Expedition Leader Dan Mazur: Rest day @ Mera. Mountain walk + yoga, then delicious lunch, hot showers, afternoon tea, fascinating conversation. Tomorrow 700m / 2300ft climb. 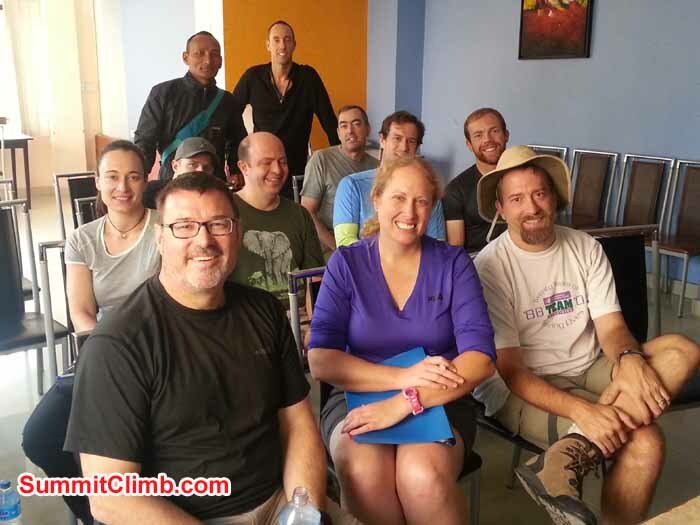 Members at hotel Shakti meeting room for expedition briefing. Preparing for going airport to fly Lukla. Sight seen in Kathmandu. Photo Markus.